During last year’s Garden Walk Buffalo, mounds of impatiens were flowering robustly at 689 West Delavan, Buffalo. But just a few weeks later, the impatiens were dropping their leaves. By September, the impatiens were gone, a victim of downy mildew. This year, Luis Martinez and Jeff Wilson were among the gardeners who had to find different plants to use in shady areas. I visited them during Garden Walk Buffalo, held July 27 and 28. With 376 gardens, it is the largest garden tour in the entire country. 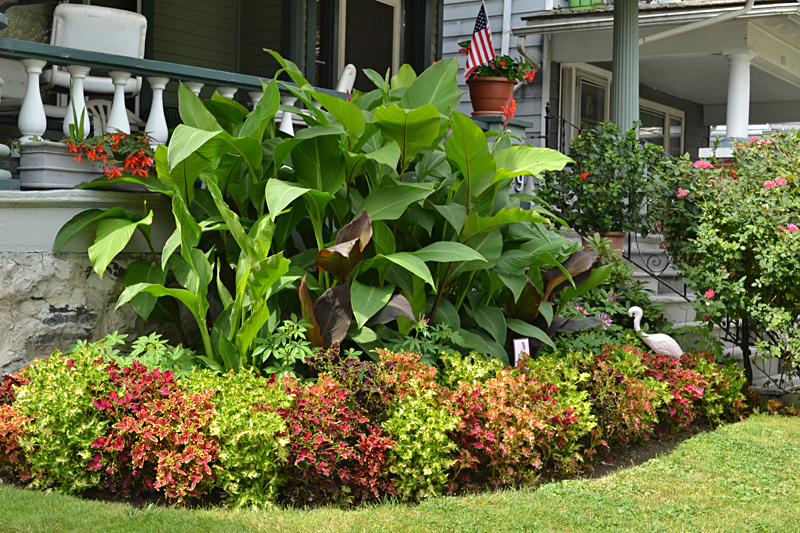 What Wilson and Martinez did in the front yard was substitute coleus for impatiens, which you can see at the base of the cannas in the photo above. The coleus gets bushy, so the plants substitute well for impatiens in that regard. Coleus comes in a variety of hues, too. “We wanted that pop of color,” Wilson said. Tip: Don’t let coleus flower, Wilson said. Pinch off the flower and the plant will get fuller. Bonus tip: Don’t throw away the part you pinched off. Place it in water or even directly in the soil and it should root. 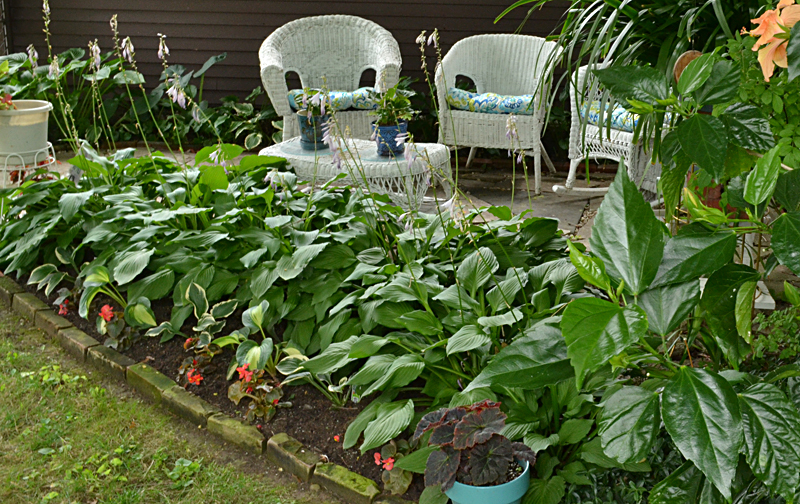 In the back, they used wax begonias at the base of large hostas, which you can see above. The wax begonias should be bigger, Wilson said, but the tree roots there sap the bed of its moisture and nutrients. Even though this summer has been wetter than last summer, he has to water the hostas every day. The bed is built atop two tree roots that were running along the surface of the soil. Wilson got tired of hitting the roots with the lawnmower, so he dug in between the roots, mounded up some garden soil and planted hostas. Wilson also planted some smaller variegated hostas just behind the wax begonias, which should fill in that area next year. If they haven’t filled in enough, he might put low pots of annuals in that area. He would have liked to use New Guinea impatiens, which aren’t affected by downy mildew, but they tend to be expensive. Kathy and Bob Barber of Jamestown tour the backyard during Garden Walk Buffalo. There are other shade-loving flowers in the garden bed behind the chairs such as bleeding hearts and violets, he noted, but they blossom in the spring. During the summer, they don’t provide a lot of color, but the leaves do add texture. Looking at the photo above, you would probably guess that since the bed just to the right of the tree trunk is directly under the tree branches, it must be a shady garden. That’s what I thought when I stood there. I was confused when I looked more closely at the plants in that area. 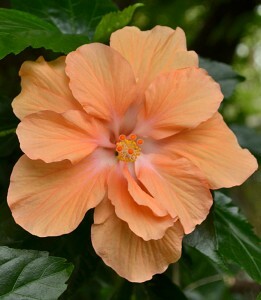 There are two orange hibiscus plants in pots there– see a closeup at left– and they like sun. Planted in the bed is a SunPatiens, and, as its name implies, it likes sun, too. Wilson explained that the area is only part shade. The corner of the fence to the right of the tree points west, and the afternoon sun bakes the area. How do you know whether you have a sunny spot, shady spot or something in between? Track the light in your garden in May, June and July. A full-sun plant needs six hours or more of light between 10 a.m. to 6 p.m. Even if you get a lot of light at 8 a.m., don’t count that because it’s less intense light. Partial sun or partial shade is four to six hours of direct sun a day. Full shade is less than four hours of direct sun a day. Here are a few more tips from Wilson and Martinez. You don’t have to be a homeowner to garden. Their landlord gives them a discount on their rent in exchange of taking care of the yard. As I’ve said before, you don’t need a lot of space to garden. 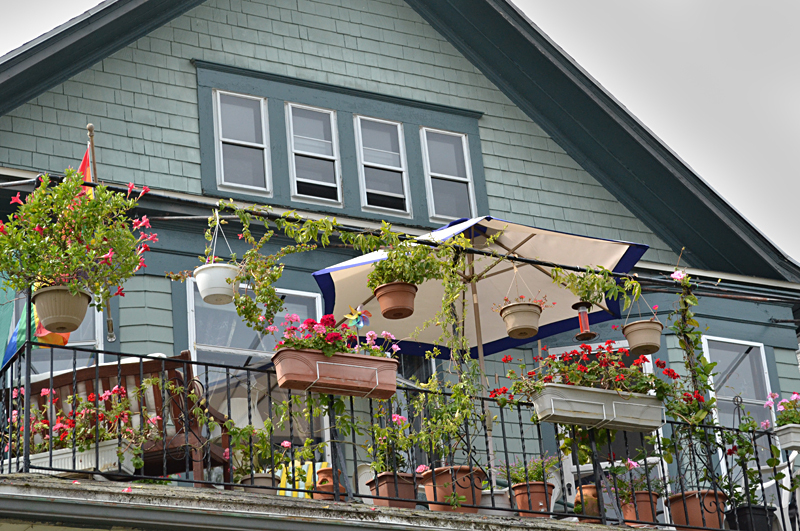 Wilson and Martinez fill their second-floor balcony with mandevilla and geraniums. They overwinter the plants in the attic. When the temperature gets into the 40s, they untangle the vines from the railing and bring the pots in, Martinez said. They water the mandevilla every week, but don’t water the geraniums. They’ve had the same geranium plants for seven years. Around early April, when the weather is getting warmer, they bring the pots back out. Sometimes the plant tells you it’s time because it starts sprouting in the attic, he said. 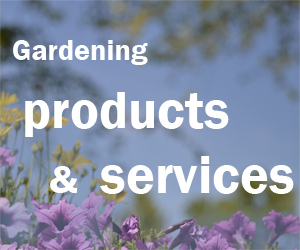 Keep your eyes open for items you can use in your garden. 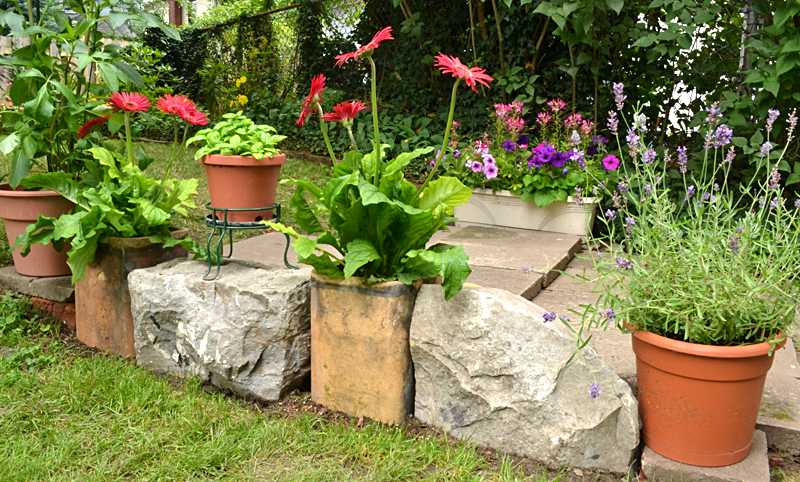 The low wall above is created by alternating rectangular containers with boulders and plastic pots. Those rectangular containers are actually chimney stacks that Wilson salvaged. Coming up: This is the final week of the National Garden Festival. 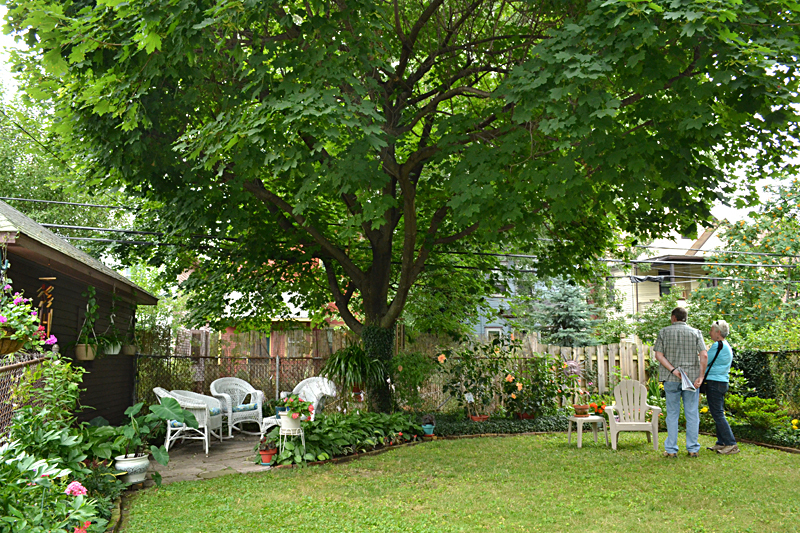 You still have time to visit Open Gardens, take a bus tour and visit one more garden walk. The Black Rock & Riverside Tour of Gardens will take place from 10 a.m. to 4 p.m. Saturday, Aug. 3, with the Starry Night Garden Tour from 8 to 10 p.m. the same day. Maps and more will be available at St. Mark’s & All Saints’ Church, 311 Ontario St., and Buffalo Religious Arts Center, 157 East St., both in Buffalo. Maps are also available at the Black Rock & Riverside Tour of Gardens website. See more details on this garden walk and other great events taking place this week on our Upcoming Events Page. I agree the first planting image is beautiful. Good gardeners know how to improvise. They always look ahead for new and different ideas. Thanks for pointing out that pinched off coleus will root if placed in water or soil.